An Afro-Middle East Centre event on November 7, 2018. South Africa need not worry about possible terrorist attacks by the Islamic State group, said most panelists at an Afro-Middle East Centre event on Wednesday. 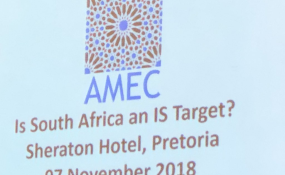 Academics, former state security officials and members of the public met at the Sheraton Hotel in Pretoria to discuss whether South Africa was an ISIS target. The symposium comes after the recent appearance of 11 men in a KwaZulu-Natal court for a mosque attack earlier this year. A man was stabbed to death during the attack, and a bomb, which wasn't detonated, was also found at the scene. Investigating officers in that case have linked the incidents to ISIS operations in the country after they found the group's flags during a raid at one of the suspects' homes. Several other bombs, similar to the one found at the mosque, were discovered in public locations across Durban, and raised more questions about whether the extremist group had been carrying out operations in South Africa. Two years ago, the Thulsie twins, Brandon-Lee and Tony-Lee, were arrested for allegedly planning terror attacks in the country. But those who were part of Wednesday's panel discussion disagreed with the notion that the extremist group had any command here in South Africa. "If an attack from ISIS does not exist in our history, why should we think it'll exist in our reality. We have a lot of other issues to deal with in South Africa," former security services officer Michael Sarjoo said. Sarjoo, who is a former principal of the State Security Agency's intelligence academy, said in his view, ISIS was not planning an attack on South Africa. He said there was no need for government to be alarmed. However, Jasmine Opperman, who is the Africa director at the Terrorism Research and Analysis Consortium, said South Africa was vulnerable to ISIS propaganda, but agreed that South Africa was "not on the radar of countries it'll (ISIS) wish to attack". She has, however, accused the country's law enforcement agencies of having no clue what ISIS is and how it operates. "They do not know what they are talking about when it comes to the Islamic group". David Africa, executive director of the African Centre for Security and Intelligence, said several factors might leave South Africa open to threats. "There is a fragile global geopolitics and the militarisation of the SA neighbourhood, including domestic fragility, economic crisis and political fracturing." He criticised the country's policies and practices in dealing with extremism. Na'eem Jeenah, the executive director of the Afro-Middle East Centre, said while there may not have been ISIS-related attacks on South Africa, "there has been recruitment of at least 100 South Africans". Jeenah said there was a high possibility that ISIS was conducting fundraising activities in South Africa, but wasn't entirely sure where this was happening.